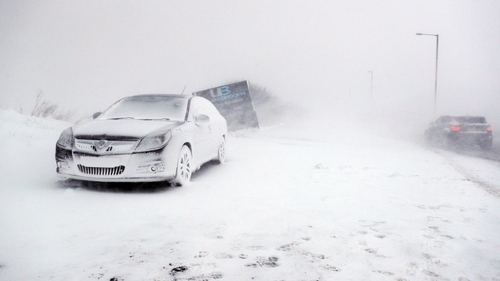 Blizzards have hit parts of the UK, as freezing conditions and heavy snow cause deaths and wreak disruption. A red weather warning - the second in 24 hours - was issued for southwest England and south Wales as Storm Emma moved in, meaning the conditions could pose a risk to life. The Met Office urged those in affected areas to prepare for widespread heavy snow and very strong easterly winds, which will bring "blizzard conditions" and "severe drifting". The weather front comes as the UK reels from the effects of recent snow storms and just hours after a red alert for Scotland ended at 10am. A seven-year-old girl became the latest to die during the severe weather. The child, believed to be a pedestrian, was killed after a car hit a house on Bodrigan Road in Looe at about 2.30pm, Devon and Cornwall Police said. A 75-year-old woman was found dead in a snow-covered street in Leeds this morning, while Hampshire Police said a 46-year-old man died after a collision involving a lorry and van on the A34 southbound near Tot Hill services. A 60-year-old man who died after being pulled from the water at Danson Park, near Welling, southeast London yesterday, has been named by the Metropolitan Police as Stephen Cavanagh. Hundreds of schools were forced to close, including more than 125 in North Yorkshire and more than 330 across Kent, giving thousands of children a second snow day. The National Grid issued a "gas deficit warning" prompting fears of a shortage, but households were reassured domestic supplies would not be affected. Nearly all train operators warned of cancellations and disruption and hundreds of flights were cancelled. The Royal Air Force was drafted in to help relief efforts in snow-hit Lincolnshire. The red snow warning issued for Wales and southwest England, valid until 2am on Friday, is just the third issued in seven years. Amber warnings for snow and wind are also in force for much of the country until 10am on Friday. Motorists across much of the UK have been warned against driving unless absolutely essential amid icy conditions and poor visibility, with Lincolnshire police describing travel on "most roads" as impossible. Hundreds of motorists on the M80 near Glasgow reported being stuck for up to 13 hours, with some spending the night in their cars, and others abandoning their vehicles. More than a foot of snow was dumped in some parts of the country - peaking with 34cm of snow in Wittering, Cambridgeshire.